Etoolsmiths provides complete JTAG Boundary Scan test systems from XJTAG backed by expert support and test consulting services. Our tools allow test and development engineers to debug, test and program printed circuit boards. The XJTAG system delivers maximum test coverage by allowing you to test all IEEE 1149.X boundary-scan compliant devices as well as non-boundary scan devices. To learn more about our products please review the sections below. To speak with an Engineer, request your free evaluation, or set up a demonstration please contact us on: 800-928-6038 or fill out our online form. XJAnalyser allows you to diagnose manufacturing problems on failing boards. Combining the test capabilities of XJRunner and XJAnalyser with additional diagnostic functionality, XJInvestigator is the boundary scan tool to use at your repair/rework station. 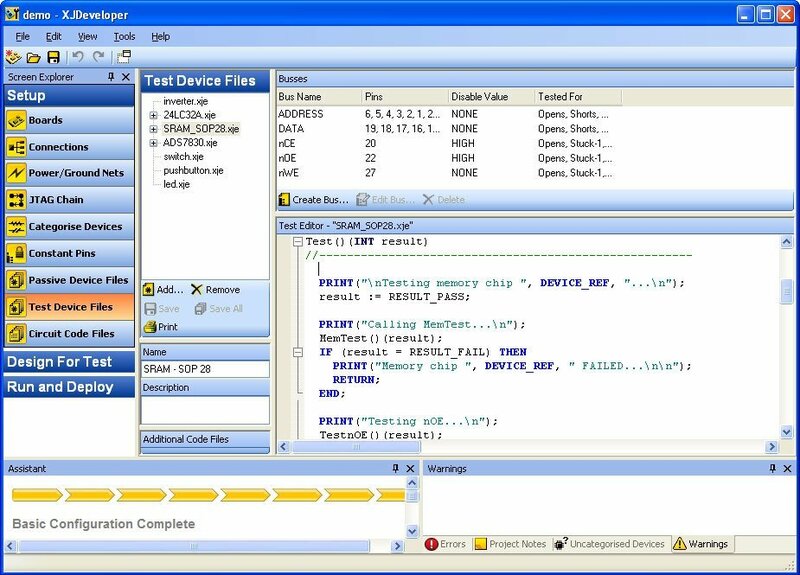 XJEase Code for a FLASH Write XJEase is powerful, high-level, block structured test description language that lets you create reusable tests for virtually any type of hardware device. 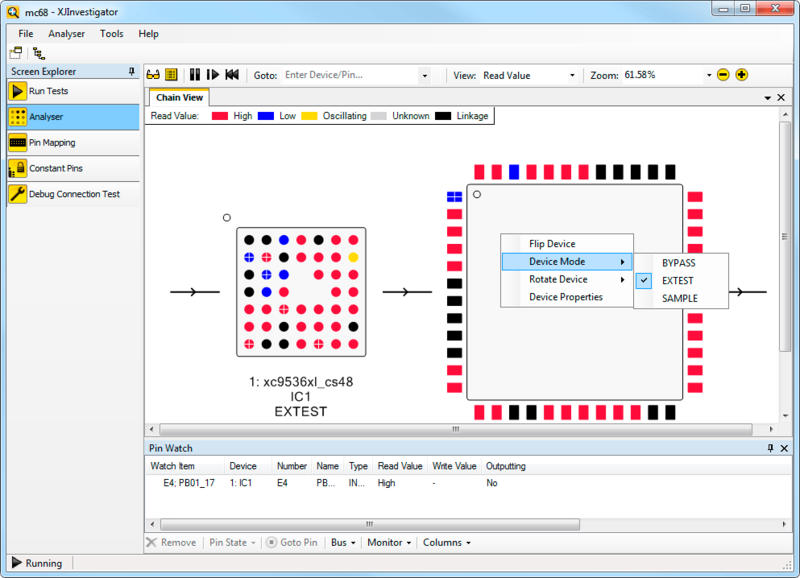 Much more than a simple macro language, XJEase was designed from the ground up to help you implement chip, board and systems level JTAG tests in a snap. The key to successful board test is coverage. XJEase provides unsurpassed test coverage with our built-in advanced connection test. The connection test provides detailed fault information making it easy to get to the root of a problem. Testing Non-JTAG devices (so-called cluster devices) has never been easier. Many popular devices are already supported in our extensive device library. XJEase is also perfect for testing JTAG-enabled devices such as: PowerPC, Mips, ARM, Micro-controllers, and processors well as programmable logic-based devices like FPGAs and CPLDs. 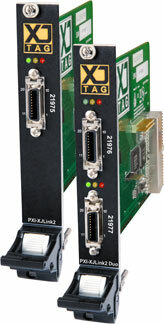 We provide several hardware interfaces for communicating with your test system: USB-Based and PXI-Based JTAG Controllers, and Digital/Analog I/O modules. To get around the annoying licensing issues found with other systems, all our hardware interfaces include a product key in the hardware so you can run the software on as many systems as you like. To test analog and digital test points that are not accessible by JTAG, we provide our XJIO module. The XJIO board comes in two flavors: stand-alone and PXI-Based. Once you have your tests created, you need an interface to allow users to run those tests. XJRunner, is a simple to use GUI interface for running your XJEase programs. Simply select the tests that you would like to run and add them to the GUI. For intergration with LabVIEW™, LabWindows™/CVI based environments we supply a complete Component Object Model (COM) interface implementation. The Component Object Model (COM) API interface can also be used to create your own C/C++, VB or C# based applications to control XJTAG based tests. Finally, for accessing JTAG Boundary Scan at the state-machine level, we provide our low-level JTAG API. The low-level API is perfect for IC level testing by device manufacturers. You can use the standard API if appropriate, or we can customize the API to your unique needs. To help you become productive as quickly as possible we provide ready-to-run tutorials and quality documentation–all backed by responsive technical support. 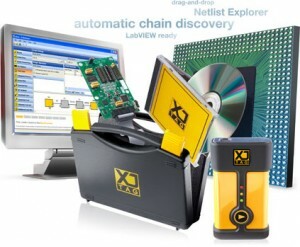 When it’s time to move to your hardware, we provide our unique JTAG Chain Debugger to help you find and rectify connection problems fast. If you need to get working tests quickly, we can do your board set up and tests for you during the evaluation process. Tests done by our team saves you valuable time, and since all tests are provide in full source form, they constitute a perfect set of examples when you begin to write your own tests.